You will be welcomed by our experienced and friendly team of local consultants Sue Laybutt, Joyce Blom, Sonya Prior and Vicki Burgess to Travel Menai Metro. Travel Menai Metro opened in November 1990, as Bangor Travel Pty Ltd, in a small office at the Bangor Shopping Centre. Since its inception it has built an impressive reputation in the Sutherland Shire as an agency renowned for its quality and personalised service. This is evident by the large number of repeat and referred clients to our office. We specialise in all forms of leisure travel, cruise, family experiences, honeymoon‘s, couple retreat’s, schoolies and retirement trips of a lifetime. 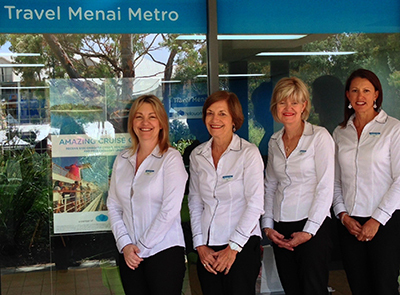 Travel Menai Metro has been selected as a premium agency with many of the wholesale partners. Our consultants have been high achievers with Qantas Holidays and our cruise partner’s for 21 years and a preferred office with APT. At Travel Menai Metro we look forward to building your dream holiday by understanding your needs and travel budget. Our team are dedicated, passionate about travel and have travelled throughout Asia, Europe, Africa, Pacific Islands , North America and Canada. We welcome all new customers and truly value our repeat clientele of over 20 years.